Visitors to Birmingham Repertory Theatre will have the chance to see a thought-provoking film exhibition made by people cared for by Birmingham's John Taylor Hospice. The Life:Moving exhibition is being hosted by the Centenary Square theatre to coincide with its production of the award-winning drama Duet for One and will runs for a month. The two are complementing each other as Life:Moving features films created by John Taylor Hospice patients with terminal illnesses and their families and Duet for One tells the story of a gifted musician diagnosed with multiple sclerosis. 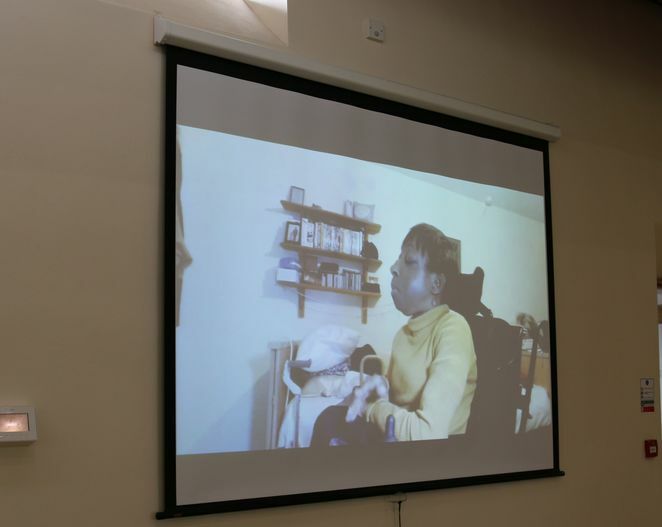 The Life:Moving footage was created with professional filmmaker Briony Campbell who worked with the patients on recording techniques and story-telling. Made over a six-month period across 2016-2017, each piece is a very personal approach to living with a terminal illness. Mum-of-three Fran Tierney, who receives support at John Taylor's day hospice, is one of the project's filmmakers. Fran, who lives in Erdington, said: "The Life:Moving film project was something completely new for me - unique and personal. Motor neurone disease is unfortunately part of my life but it doesn't define who I am and through the film I was able to be completely honest about my life and thoughts and convey who I am. I thoroughly enjoyed being part of the project." Life:Moving - funded by the Arts and Humanities Research Council - forms part of an academic research project examining the ethical issues surrounding filming people at end of life. Principal investigator Michele Aaron, Associate Professor of Film at the University of Warwick, said: "Working with the patients at John Taylor Hospice has been a real privilege and the films they made are very special in their honesty and tell us a lot about the power of film. Each person is an individual so it is not surprising that their films are also very different. Life:Moving challenges society's misconceptions about terminal illness by giving those experiencing it the opportunity to share their true stories with a wide audience." The films are available to watch on screens on the first floor of the theatre between September 22 and October 21. Duet for One, which plays at The Rep between September 22 and October 7, stars Belinda Lang as Stephanie, a talented musician who develops multiple sclerosis, and Oliver Cotton as Dr Feldman, the psychiatrist to whom she pours out her heartache. Premiered in 1980, the Tom Kempinski play was a hit on both Broadway and London's West End. The current tour is produced in association with The Rep and it premieres in Birmingham before visiting other venues across the country. John Taylor Hospice art psychotherapist Jed Jerwood, who also worked on Life:Moving, added: "We are delighted that The Rep is supporting Life:Moving by hosting the exhibition alongside Duet for One. I would urge anyone in Birmingham city centre to pop along and watch one, or all, of these films which are not only thought-provoking but also life-affirming." For more information on Life:Moving and the hospice see www.johntaylorhospice.org.uk and for more information and tickets for Duet for One see www.birmingham-rep.co.uk or call 0121 236 4455.